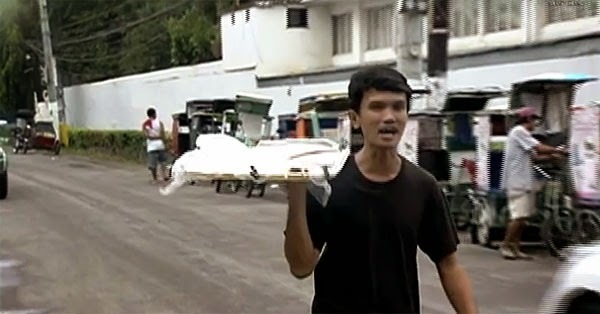 The English-speaking banana cue vendor from Pampanga, who was dubbed Banana Man in a video that went viral, was featured Sunday on Rated K.
Thirty-eight-year-old Allain Lulu of San Fernando City shared that he has been selling banana cue tirelessly for 16 years to earn for a living and to send his children to school. The father of three solely takes care of his kids because his wife, who works in Manila, seldom comes home to visit them. Instead of spending her earnings for travel, she saves the money and have it sent to support the family. Everyday, Allain regularly sells 100 sticks of banana cue around town. To catch people's attention and attract buyers, the Banana Man thought of speaking English to customers. Allain's business strategy turned out to be effective. After his video garnered over 1.3 million hits on YouTube, his frequent and loyal customers increased significantly. He now earns P700 a day on a regular basis. As a surprise gift for the English-speaking banana vendor from Pampanga, the show's host Korina Sanchez gave him a bicycle-driven cart complete with stove, frying pan, and other cooking utensils so he will no longer sell by foot. Banana Man's children also received clothes from a Rated K sponsor. Allain Lulu said the cart is of big help since he can already sell freshly-cooked banana cues right at his clients' doorsteps.